The Freemotion 3500 XLS treadmill is a fully loaded, luxury package TV machine, high on style, long on mileage, and reasonably priced at under $3,000. Like the rest of the Freemotion treadmill models, this unit is worth every penny and offers among the best value in the industry. The Freemotion 3500 XLS treadmill’s scrolling, 8" x 30" LED matrix displays your workout graphically while multiple LED windows display Incline, Pace, Time, Segment Time, Distance, Calories, Pulse and Speed. Experience the thrill of taking your cardio pace to a higher level by working out with the Personal Trainer Programs, including: 3 cardio, 3 endurance, 2 finish line, a fitness test, and much more. UPDATE: The 3500 XLS is no longer being produced or sold. Check out all of the most popular FreeMotion treadmills on sale now at Amazon for a comparable model. Expert reviews of the Freemotion 3500 XLS buzz about the huge 3.5" precision crowned rollers which work to reduce noise to a minimum and allow the user to enjoy a smooth, quiet ride on the cushioned deck. The 1-touch controls, huge incline (15%), long 60" belt, powerful AC lift motor to raise and lower the deck, and a self-cooling 3.5 CHP Pro motor to run the belt -- all combine to give you the feeling that you are running on a commercial-grade treadmill. 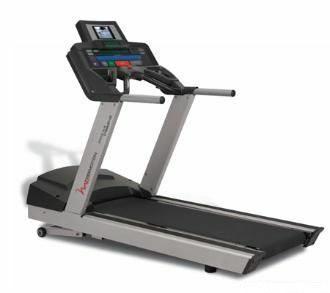 Many owners of this unit are fitness professionals so they have already compared this machine to treadmills they use at their gyms and health clubs. Their verdict? Thumbs, way up. The Freemotion 3500 XLS is a comfortable and solid treadmill, and it offers plenty of workouts as well as entertainment on the dash. Since this is a large unit (83" x 33" x 63"), the fold up design seems unnecessary since users are not able to wheel this 400-pound behemoth out of the way. That being the case, we suggest you leave the 3500 XLS unfolded in your home gym when not in use -- in order to show off this work of art to envious guests. Selling for $2699 ($3499 MSRP), the Freemotion 3500 XLS rates extremely high for value, superior quality, durability, style and features. If your health club is not conveniently located where you’ll go every day, the purchase of a club quality model such as the Freemotion 3500 XLS treadmill is an attractive alternative. You won’t have to stress over membership fees, contracts, opening and closing times, or finding an available machine. You can achieve your fitness goals right at home with a superior treadmill you’ll be proud to own.